Home / Industrial / What makes wrench the most important hand tool? What makes wrench the most important hand tool? Wrenches are a hand tool which makes its place in the gearbox of every mechanic or workmen who deals with nuts and bolts. It is a device which helps in tightening or loosening of bolts by holding it firmly in its own place. A wrench is designed as such that it fits the bolt head exactly and restricts it from slipping while spinning. Every piece of machinery today has some usage of wrenches. The size of the bolts is differently built to fit the designated machinery. Wrenches come in different size and shape to exactly meet the requirement of each standard bolt. Wrenches are built from chromium-vanadium alloy. The chromium plating helps the wrenches to stay away from rust. These are strongly built as it is used extensively in household work and also for industrial work. Eastman Hand Tools is an eminent name as theadjustable wrench manufacturer in India. Wrenches come in different types and are mainly classified into three parts namely open end, box end and a combination of both. ü An open-end wrench has u shaped opening on both ends which are different in size. The gauge of the wrench is denoted by numbers. This type of wrench consists of different gauge of opening on both ends which can be used for 2 different sizes of bolts. ü A box end wrench is a closed end wrench which usually makes a hexagonal shape at both ends of the wrench. These wrenches are fastened into a bolt which has an emerging surface and sometimes it is bent as a lever which gives the handler an edge to hold it and put extra pressure on it which is not possible in case of flat handled open wrench. You must have seen it in the toolbox of a mechanic at a garage while they use it to open or tighten the bolts of a car’s wheel. This type of wrench is best suitable for places where an open wrench cannot reach. ü As the name suggests, a combination wrench is a combination of both open as well as box wrench in either side. These type of wrench consists of an open-sided concave wrench in one size while the other side comprises of a hexagonal loop wrench. Both the ends come in the same gauge as they are used in combination for a single bolt. Unlike box and open end wrench, they can only be used for one size of bolt only. 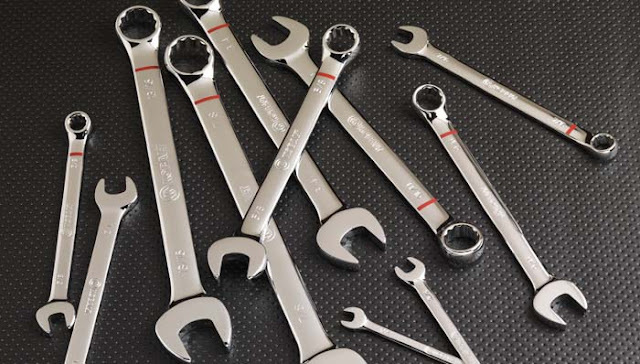 There are other types of wrenches as well such as an adjustable wrench, torque wrench, socket wrench, Allen wrench etc. All these types of wrenches have individual work and are well crafted to carry on such work. Therefore, wrenches hold a special place as a hand tool for mechanical work. While buying a wrench the material must be judged as it will undergo a lot of pressure and should sustain for a lifetime. There are many wrench suppliersto choose from who caters to every requirement ofwrenchs in India.